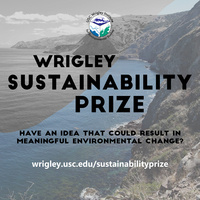 The USC Wrigley Sustainability Prize is an annual entrepreneurial competition supporting environmental ideas with market potential from within the USC community. Join us as this year's finalists pitch their ideas to the public and a panel of expert judges from the business and sustainability communities. Support student entrepreneurship and learn about the most creative new ideas to merge business with sustainable living. Winners will be selected and recognized at the end of the event.